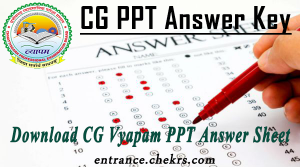 CG PPT Answer Key 2019 (छत्तीसगढ़ प्री पॉलिटेक्निक टेस्ट आंसर शीट): Chhattisgarh Professional Examination Board (CGPEB) is going to release the CG Vyapam PPT Answer Key of the written examination soon via online mode. The CG PPT Exam is conducted by CGPEB for providing admission in Diploma courses in various Government and Private Universities of Chhattisgarh. In regards to more details check the articles below. After CG PPT Entrance Exam ,applicants can download CG Vyapam PPT Answer Sheet through its official site. The answer key includes the correct answers of all the questions of its various sets. With the help of the CG Vyapam answer key, applicants can get the precise idea about his/her performance in the examination. The answer key gets displayed in the screen in pdf format. Save and take print copy of the answer key for future use. The Director of Technical Education, Chhattisgarh State will release cut off of CG PPT soon and the candidates must secured the cut off marks in order to qualify the examination. All the aspirants who meets the cut off criteria will only be eligible to take admission into the polytechnic course offered by CGPEB. The CG Vyapam PPT results will soon be uploaded on its websites and candidates will be provided admission upon merit basis. After the declaration of the CG PPT Results we will also update you here with same. For more information keep visiting our site. In terms of any query place your comments in the commenting section below.